It’s that time of year again. The trees are blooming, the sun is shining, the birds are singing and it’s time to clean the house! 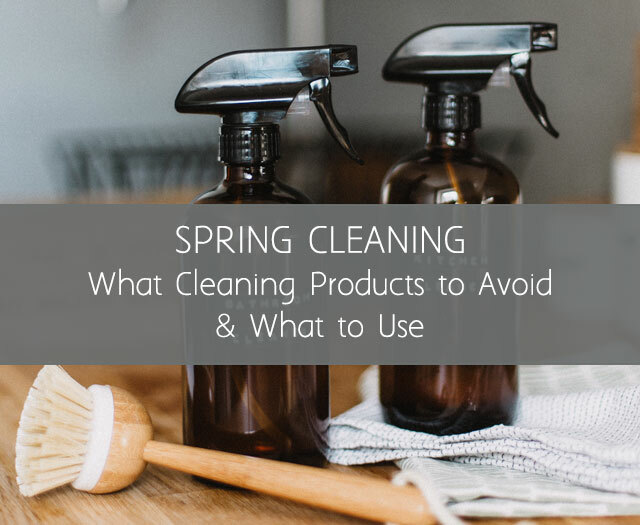 With thousands of products on the market I want to show you the spring cleaning products to avoid. Sadly our culture has taken the sanitation standard to a whole new level, by that I mean we are over cleaning! Let me take some pressure off of you this spring. Yes, cleaning is important and it’s healthy but let’s not over do it. There is a lot of good bacteria out there, and even the bad bacteria? Well, that helps build our immune systems so we can grow stronger with every strand of flu virus that makes it way into our home. I want to walk you through four spring cleaning products that you should avoid in your household. Some of them are labeled “safe” or “eco-friendly” but are they really? We are going to break it all down for you today and give you the tools to make smart purchases and how to clean your house without over-sanitizing. But the cleaning product companies don’t make it easy for us to know which brands are safe. The US Law does not mandate that they share ALL of their ingredients. Sometimes, the safest way to clean is to make your own. Antibacterial products have an ingredient in them called triclosan. This ingredient increases the development of drug-resistant superbugs. Antibacterial soaps have also been proven to be no more effective than regular soaps, and triclosan has also been proven to interfere with the normal function of the thyroid. Crazy huh? Instead, use a simple mixture of 9 parts water, 1 part white vinegar as a basic cleaner that kills germs. These products often trigger allergies and other lung related issues such as asthma, and the chemicals that are included in the list of ingredients of dryer sheets have major effects on your nervous system. Fabric softener has another long list of chemicals included in their ingredients and all of the chemicals have been linked to cancers and respiratory diseases. Overexposure to formaldehyde can damage the central nervous system, increase the risks of headaches, depression, mood changes, irritability and insomnia. The problem with this chemical is that it is everywhere, and it is hiding in many every day products. Some brands to avoid that have this chemical are Ajax, Palmolive, Orange Grease, Finish, and Woolite. The harmful ingredients found in air fresheners have been known to cause birth defects and reproductive harm. They can also be toxic to the liver and kidneys and have been linked to cancers. One of the safest alternatives is to use essential oils and diffuse them. There are also DIY candles you make, and simply opening your home to some fresh air helps with odors. What Do You Mean Too Clean? 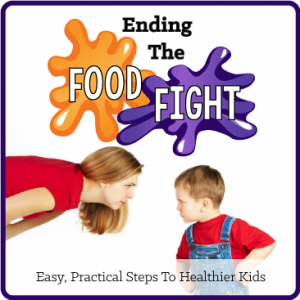 In our desire to keep our families healthy and eliminate all of the bad germs, we wipe out the good germs as well. Yes, there is good bacteria out there. And without these beneficial bacterias we are weakening our immune systems, we are negatively affecting our hormones and we are causing digestive issues and vitamin deficiencies. So, when a family member is sick, don’t feel like you need to go overboard with killing all the germs. Clean, wipe, use oils and vitamins for immune system boosters, but stop there. There are more children out there with allergies and weakened immune systems because of over cleaning then actually being exposed to germs. God made our bodies strong and resilient. Let them grow stronger! 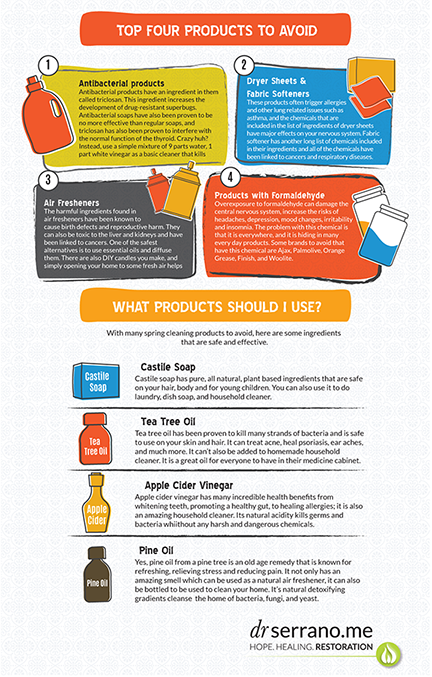 With many spring cleaning products to avoid, here are some ingredients that are safe and effective. Castile soap has pure, all natural, plant based ingredients that are safe on your hair, body and for young children. You can also use it to do laundry, dish soap, and household cleaner. Tea tree oil has been proven to kill many strands of bacteria and is safe to use on your skin and hair. It can treat acne, heal psoriasis, ear aches, and much more. It can’t also be added to homemade household cleaner. It is a great oil for everyone to have in their medicine cabinet. Apple cider vinegar has many incredible health benefits from whitening teeth, promoting a healthy gut, to healing allergies; it is also an amazing household cleaner. Its natural acidity kills germs and bacteria whiithout any harsh and dangerous chemicals. Yes, pine oil from a pine tree is an old age remedy that is known for refreshing, relieving stress and reducing pain. It not only has an amazing smell which can be used as a natural air freshener, it can also be bottled to be used to clean your home. 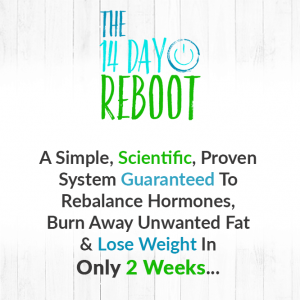 It’s natural detoxifying gradients cleanse the home of bacteria, fungi, and yeast.